Over the years that I have been working on this blog, I have started looking at every aspect of the cooking process: following recipes, learning new techniques and discovering new ingredients and figuring out how to use them. And as I have been looking at all of these things, I have come to a few conclusion about how one learns to cook. It started out as an awareness, which turned into a theory. Over time, the theory has been tested and, with some exceptions, has turned out to be valid, at least in my kitchen. I'm calling it the Law of Three. To wit: In order to get comfortable with a new recipe, technique or ingredient, one must use it at least three times. I took my theory and articulated it into this law while I was working on corn chowder. It took longer than usual for the corn to show up at the green market, and even longer for it to go down in price, but that finally happened a few weeks ago. I bought a lot. And I was looking for new ways to prepare it. Potatoes have also been plentiful at the market, so I had a few of those too, and thought to combine the two. Since my recent success with vegetable stock, I have been more serious about finding uses for corn cobs once I have removed the corn. 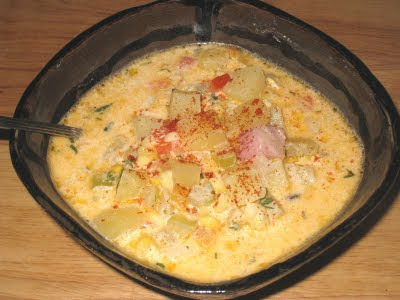 I decided to look for some ideas for a corn chowder. And, as usual, found something that looked right up my alley at Elise's Simply Recipes. I thought any corn chowder recipe would involve a roux, so I was surprised to discover that the version on Elise's blog did not call for one. I liked that, so I decided to use her version as the base for my attempt. I followed Elise's version fairly closely for my first attempt. The main difference was that I used leeks instead of onions. I have been playing with a leek and potato soup (which I have not perfected yet, so I am not ready to write about it), and I really like that combination. Corn seems like a natural companion, so I decided to stay with that combination. I also had three beautiful leeks I had bought at the green market. You can't argue with that. All in all it was a success. The main problem, and it was minor, was that I cooked the potatoes too long and they turned into mush. But the flavors were there so I decided it was worth making again. For my second attempt, I made sure not to cook the potatoes too long. Unfortunately, however, I did not cook them long enough. There were also too many of them, as well as too much corn. I usually do not bother too much with proportions, especially in soups and stews, but the chowder lacked balance between liquid and solid. The slightly underdone potatoes did not help, either. It was edible, but not as good as the first batch. So I went at it one more time. Armed with what I knew worked from the first batch, and what didn't work from the second attempt, I knew when to check the potatoes to make sure they had cooked through without turning to mush. I knew how much potato and corn to add. I knew how low to have the burner on to cook the potatoes without scalding the milk. The end result? Pretty near perfection, I must say. A rich flavorful broth, soft creamy potato and crisp sweet corn. A beautiful way to enjoy the fresh bounty of summer. It's substantial enough for a meal, while at the same time being light enough for the season. Of course, by this time I had run out of leeks so I used an onion. It would be just as good with either. And there you have it. The first try gives you the base of a recipe. The second time you make adjustments that may or may not work, and compare them against the first. By the third time, you know how you want it, and you have some experience in how to make that happen. The Law of Three. There's a good chance that you will like this recipe just as it is. But if you think you can improve on it, I bet it will take you two more attempts to get it just where you want it. Melt butter in 3-quart saucepan over medium heat. Add onions and cook until translucent, approximately 5 minutes. Add carrots and celery and cook another 5 minutes. 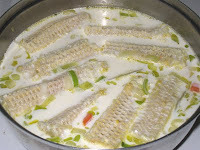 Nestle the corn cobs in among the vegetables and cover with the milk. Add the bay leaves. Bring to a boil, then lower the heat to the barest simmer and cook for 30 minutes. Do not let the milk scald. Remove the corn cobs and the bay leaf and add the potatoes and bell pepper. 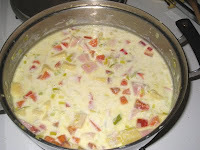 Bring to a boil, reduce heat, and cook for another 15 to 20 minutes, until the potatoes are just tender. Add the corn, ham, thyme and paprika and cook another 5 to 10 minutes, until the corn and ham are warmed through. Adapted from Elise's recipe on Simply Recipes.